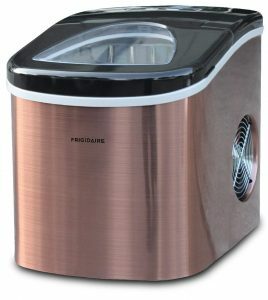 Frigidaire EFIC117 is a countertop style portable ice maker that is very easy to operate and with a daily capacity of 26 pounds of nugget shaped ice. You can purchase it in copper stainless steel or silver (EFIC108) colors at the same price. This ice maker has an average score of 3.7 out of 5 stars by 49 customers at the moment of our product review and we’ll have a look at these customer experiences. The modern ice machine is able to make ice in about 6 minutes to a total capacity of roughly 26 pounds per 24 hours. You can watch the ice making process with its transparent (see-through) design. There is a convenient and easy to read LED-backlit digital control panel with different ice making controls. The ice maker weighs 17.8 pounds and measures 13 x 13 x 9 inches- it can have a permanent spot on your kitchen counter and it is easily portable when you want to move it to another location. 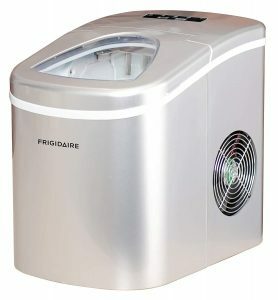 Frigidaire Ice Maker does not have a compressor for keeping the ice frozen and the ice cubes will melt back into the water reservoir for more ice making. There is a certain amount of water it can hold and there won’t really be any overfilling. It is just that the cycle will start over when you press the Start button for more ice. The ice maker can be cleaned easily with some vinegar in water cycled a few times into ice and out. You’re always better off using filtered water with any ice making process as you’ll get a higher quality, clearer and harder ice than with tap water. Generally speaking it will simply not be as good with tap water, which could be to do with the lime and chlorine content of tap water. There is no annoying beep sound on this specific model like on some other ice makers on the market. The only time you’ll hear any noise is when the ice starts dropping. The ice it makes is in the shape of nuggets or igloos and you can certainly choose from small or large sizes, depending on where you’ll use your ice. As long as you use pure filtered water there won’t be an after taste with this ice maker, even if you’re picky about smells and tastes. You don’t need to hook it up to a water line and you will just fill the reservoir with water through the front lid. There is a bottom plug for draining the unused water when you want to. It is built durable, you can use it every day for making ice and should last you a long time. It does what it is supposed to do very well and overall you’re getting a pretty decent deal.